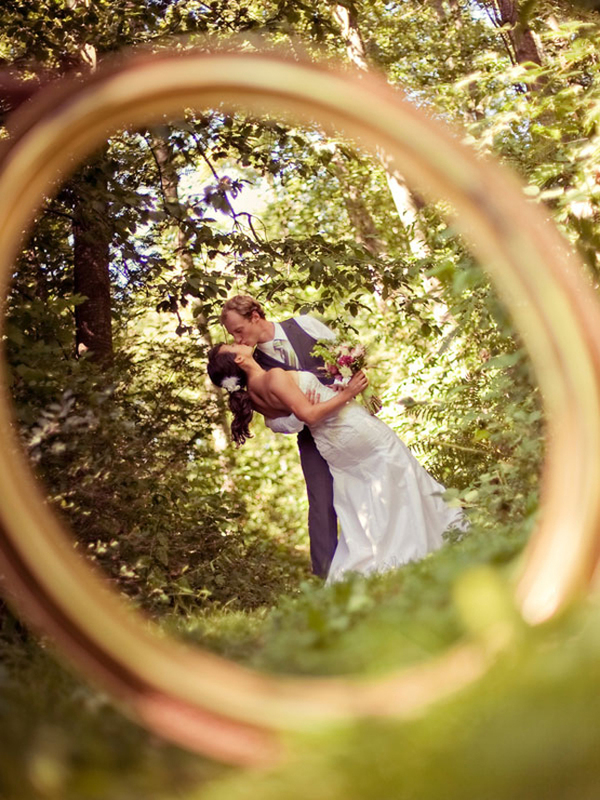 Have you ever thought about framing wedding photos? I don’t actually mean framing printed wedding photos (although that’s always nice), but using an actual frame in a wedding photo to draw focus to the bride a groom. Framing is a photography technique that provides a quick way to focus attention on a particular subject and to enhance the sensation of depth in a photo. To frame appropriately, photographers use some object or shape in the foreground to serve as a frame within a frame, like an overhanging tree branch that frames a landscape, an archway, a doorway, or a window—just about anything that lets you look through one thing and draws your attention the focal point. Using actual picture frames for framing is a growing trend in wedding photography; brides and grooms are requesting to add frames to their wedding photos in any way they can. In the photograph below, the simple brown frame is held in such a way that does not detract from the beautiful image of the groom and his bride. 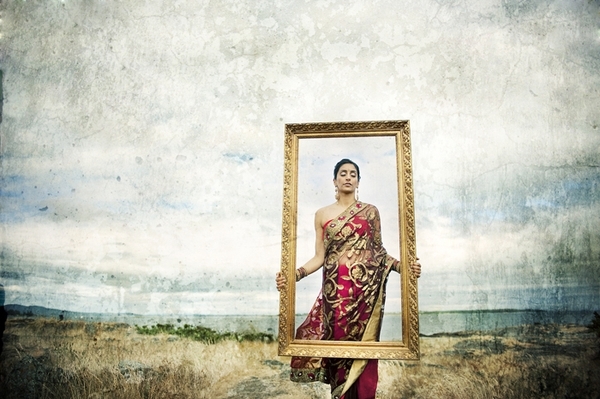 The frame draws our attention on to their faces without completely neglecting any other aspect of their surroundings. The next photo is a bit whimsical as the bride and groom use a standing frame as a windowsill of types in the middle of a wooded area. Much like the previous photograph, this photo focuses on the bride and groom without detracting from their beautiful surroundings. 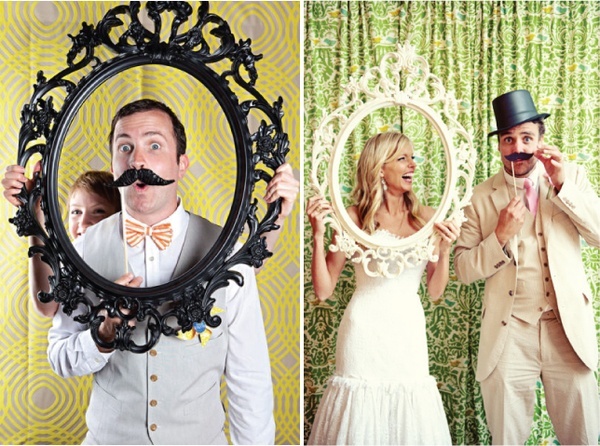 Even without an incredible outdoor backdrop, a bride and groom can capture some fun and whimsical moments with a frame. 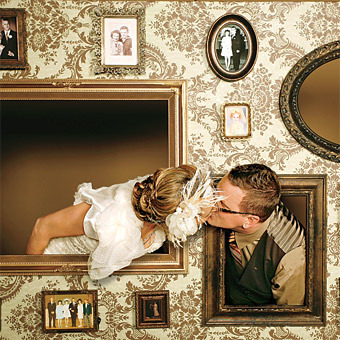 For some framed wedding photos, brides and grooms make use of actual walls that are built for this very purpose–walls that use frames with open backs to allow for bride & groom, and guests to be photographed through the frame. Take a look at the photograph below for an example. Talk about a photograph coming to life! Like the bride and groom in the next photograph, some brides and grooms don’t want the traditional frames-hanging-on-a-wall look and opt for something different. Something like a frames-hanging-from-trees look. 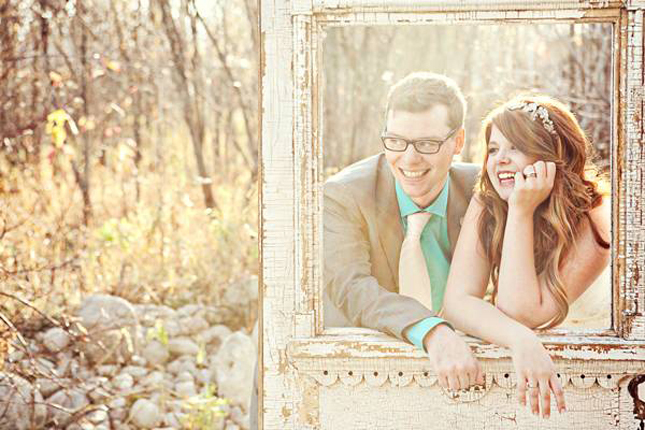 Brides and grooms are finding more ways to be creative with frames and to allow their personalities to shine through. 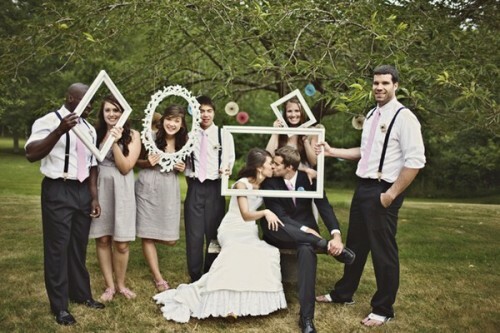 Frames in wedding photographs don’t need to include both bride and groom. Take the next photograph as an example. This photograph highlights the bride alone and captures her beauty and the beauty of her serene surroundings. But if solo shots aren’t your thing, grab a few extra frames and capture some fun shots of the entire wedding party. 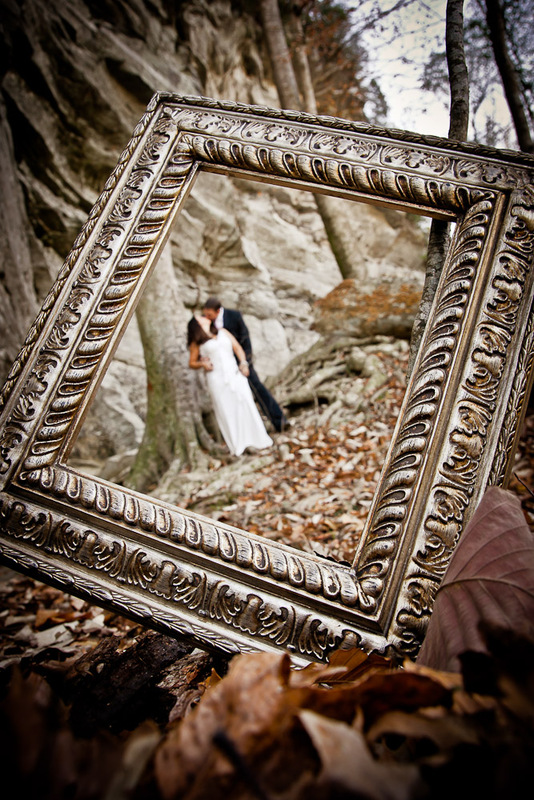 Framed photos are a growing trend in wedding photography. There are many ways we can capture a beautiful framed wedding photograph that will provide a quick way to focus attention on those most deserving of that attention on their wedding day: the bride and groom. The next time someone asks you if you want framed wedding photos, you may need to ask which kind they’re referring to.